One of things that I like to try to do with my questing schedule it to make sure I get some time to complete explorer zones. I usually try to do some explorer area runs right after I get home from work during the typical work week and on Monday nights when I’m also playing digital PNP with some friends (since my attention can be diverted from DDO on those nights for quite a bit of time). Recently, I completed a few of these areas. 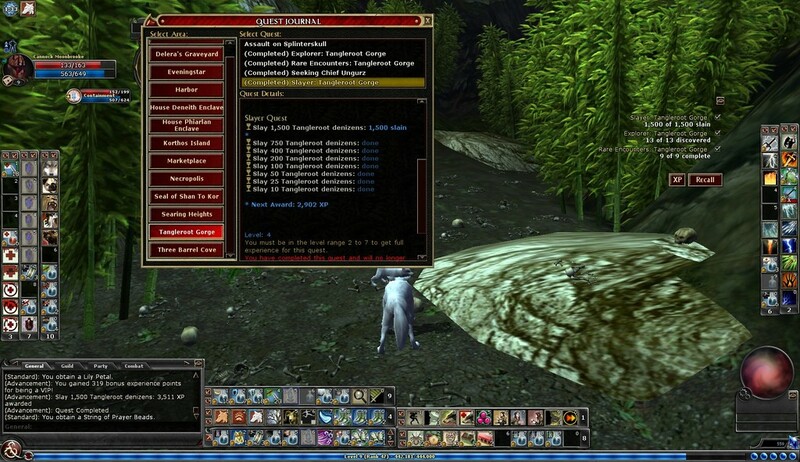 Erdrique (Level 13 Bard) and Sttollen (Level 14 Rogue), while dual boxing, completed Sorrowdusk Isle. It took me forever to finally come across Vermilo during this go round but he eventually sprang forward. Erdrique and Sttollen finally find Vermilo to finish up Sorrowdusk Isle. Cannock (Level 9 Druid) completed Tangleroot Gorge, which was ironic because he completed Three Barrel Cove prior to Tangleroot Gorge, primarily because he was also dual boxing with my other account and the majority of my characters on that account happened to need Three Barrel Cove. Therefore, Cannock saw more time in that area. But he eventually completed Tangleroot. Cannock finally finishes Tangleroot Gorge. To end things out Containment (Level 9 Cleric) maxed out Three Barrel Cove, where he received a lot of help from Cannock and Berann (Level 10 Barbarian). Getting some help, Containment completes Three Barrel Cove. Now Erdrique and Sttollen get to move onto the Red Fens (where they will both be guzzling down some slayer potions as reaching 7,500 max kills in that small zone is a huge task to do) while Cannock and Containment get to move on to the Searing Heights were they get to challenge some Sulatar drow and Blood Tide pirates. Looking forward to it!! Thanks for reading everybody and happy hunting in those explorer areas!! In my last article about analyzing the numbers of my monster manual, I took a look at the diversity of monsters that Kolll, my level 22 Arcane Archer/Shiradi Champion, defeated. In this article I take a look at the opposite side of things, what monsters accounted for his defeats. Unlike what I saw with Erdrique and Hamllin, the trends I noticed here showed that Kolll’s defeats by monster type did not follow the same trends for my account as a whole. Kolll’s top three adversaries were player races, monstrous humanoids, and elementals/abberations (Table 1 and Figures 1 and 2). For the entire account the top three enemy types that accounted for the most of my characters death were humanoids, player races, and undead. Across my entire account, Kolll accounted for just about 3.5% of my total deaths. Table 1. Number of defeats suffered by Kolll, my account, and the percent Kolll accounted for by monster type. Figure 1. 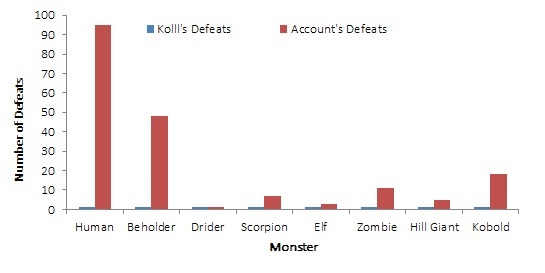 Proportion of Kolll’s defeats by monster type. Figure 2. Number of defeats by monster type for Kolll and my account as a whole. The next thing I wanted to look at was Kolll’s kill ratio and his death rate and how these statistics compared to my account as a whole. I explained how these statistics are calculated back in this blog post. Tables 2 and 3 and Figures 3 and 4 illustrated these trends. 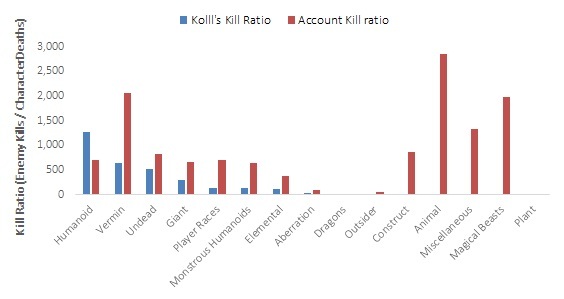 Kolll’s highest kill ratio were for humanoid, vermin, undead, giant, and player races. These particular ratios ranged from just over 100 to over 1,000. Comparing these trends account wide, these monster types ranged in the middle area for my account as a whole, except for vermin which also had a very high kill ratio. Table 2. Kill ratio statistic by monster type for Kolll and across my account (sorted by highest ratio for Kolll). Table 3. Death rate statistic by monster type for Kolll and across my account (sorted by highest death rate for Kolll). Figure 3. 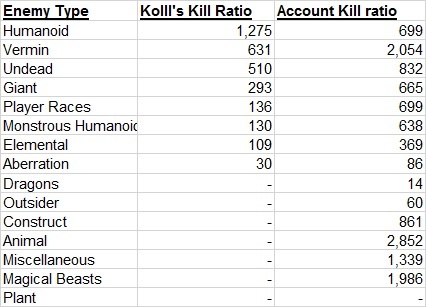 Kill ratio by monster type for Kolll and my account. Figure 4. 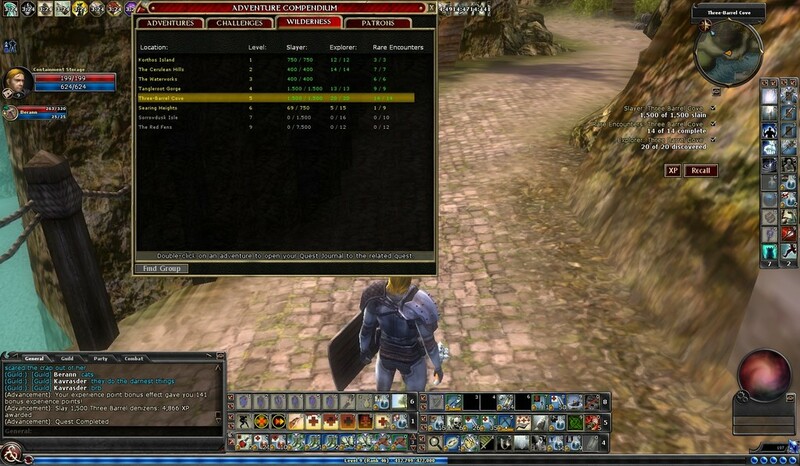 Death rate by monster type for Kolll and my account. Looking at the death ratio statistic, the most dangerous enemies Kolll encountered were aberrations, elementals, and monstrous humanoids. A comparison to the death rate statistic account wide showed some divergent trends. Account wide, dragons, outsiders, and aberrations accounted for the top three deadliest enemies. 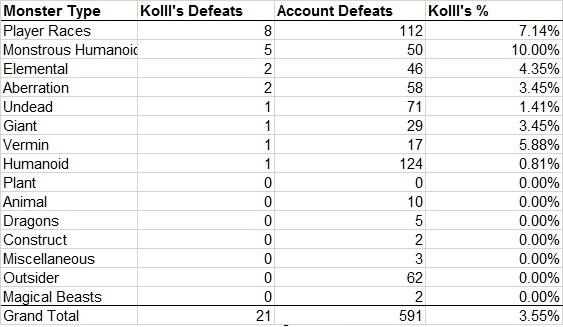 I took a broader look at Kolll’s defeats and compared them to my account as a whole across monster manual volumes (Table 4-6 and Figures 5-7). 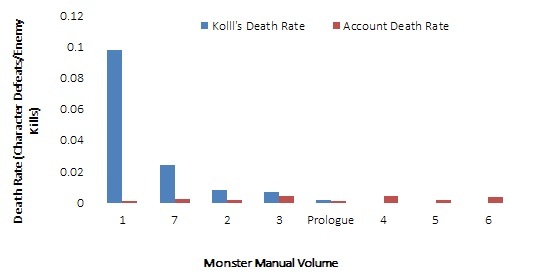 Across the eight volumes (Prologue + Volumes 1 thru 7), the monsters in Volume 2 accounted for the majority (9 deaths) of Kolll’s defeats than any other volume. Comparing the trends of Kolll’s defeats to all of my characters, the trends were quite different. Kolll suffered the majority of his defeats from monsters in Volume 2, while across my entire account the majority of deaths were due to monsters in the Prologue. Kolll’s second leading volume was Volume 7 while account wide it was Volume 1. Taking a look at the percentages that Kolll accounted for by volume is also interesting. Kolll accounted for less than 10% in the majority of the volumes, but in Volume 7 the number of deaths he suffered accounted for 80% of deaths on my account. Table 4. Number of defeats by monster manual volume for Kolll and my account and the percent Kolll accounted for. Table 5. 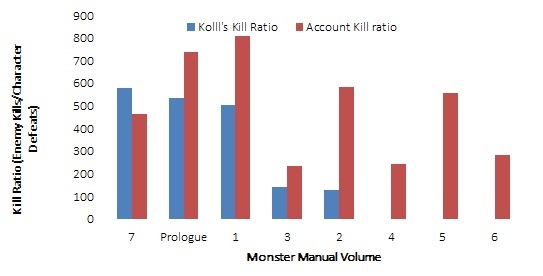 Kill ratio for Kolll and my account by monster manual volume (sorted by highest kill ratio for Kolll). Table 6. Death rate for Kolll and my account by monster manual volume (sorted by highest death rate for Kolll). Figure 5. Total number of defeats by monster manual volume for Kolll and my account. Figure 6. Kill ratio by monster manual volume for Kolll and my account. Figure 7. Death rate by monster manual volume for Kolll and my account. I noticed some interesting trends when I looked at the number of defeats by monster race (Tables 7-12 and Figures 8-15). The monster races that accounted for the top five defeats for Kolll were minotaur, warforged, drow, mephits, and sahaugin. These trends definitely reflect those I saw when I looked at defeats by monster type. Comparing these to the top five for my account; humans, hobgoblin, beholder, skeleton, and troglodytes we see quite a divergence What I found really interesting is that Kolll accounted for 100% of my account’s defeats against drow and 43% of my defeats from warforged. 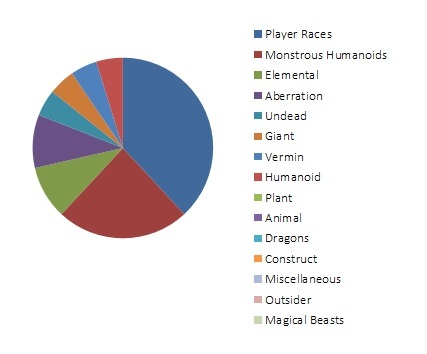 Looking at the opposite trends, monsters that accounted for the least number of deaths for Kolll (excluding those that Kolll hasn’t suffered a defeat against) include humans, beholders, driders, scorpions, elf, zombies, hill giant, and kobold. At the time I pulled this data, Kolll hadn’t suffered a defeat against 62 different monster races, at least to date (a good portion of these he hadn’t yet encountered). Account wide, this number is only 17 races. Table 7. Top five monster races by number of defeats for Kolll, the number of defeats those races accounted for on my account, and Kolll’s percent of those defeats. Table 8. Monster races that accounted for the fewest number of defeats for Kolll, excluding those Kolll never suffered a defeat from. Table 9. List of monsters that Kolll has never been defeated by and the number of defeats those same monsters have accrued against my account. Figure 8. Top five monster races that defeated Kolll and their respective defeats account wide. Figure 9. Monster races that accounted for the fewest number of defeats for Kolll and their respective defeats account wide. 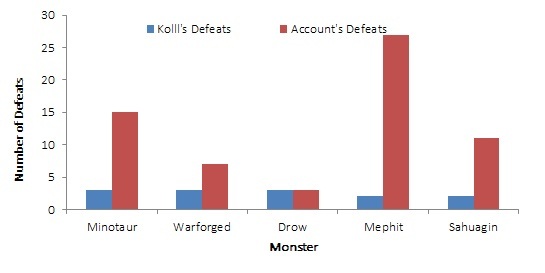 Taking a a more detailed look at the monster races that accounted for Kolll’s most defeats, drow had the lowest kill ratio and the highest death rates, indicating that these monsters are the most dangerous encounters for him, at least with those from the top five in defeats. Looking at the kill ratio and death rate statistics for those races that accounted for the fewest defeats, driders and beholders were the most dangerous for Kolll, and in fact the one encounter he had with a drider resulted in a defeat and at the time I pulled the data he hadn’t had a chance to encounter any others. Table 10. Kill ratio and death rate for the top five monster races by number of defeats for Kolll and the same statistics for my account as whole for the same monster races. Table 11. 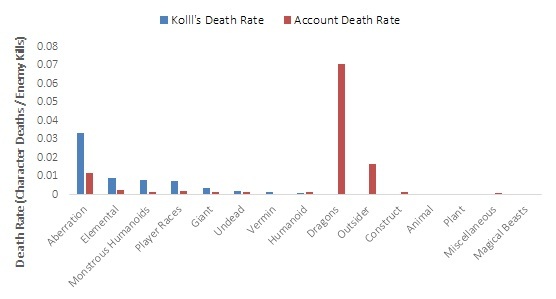 Kill ratio and death rate for the monster races that accounted for the fewest number of kills for Kolll. Figure 10. Kill ratio for the monsters that accounted for most of Kolll’s defeats. Figure 11. Death rate for the monsters that accounted for most of Kolll’s defeats. Figure 12. Kill ratio for the monsters that accounted for the fewest number of defeats for Kolll. Figure 13. Death rate for the monsters that accounted for the fewest number of defeats for Kolll. The last analysis I did was too look at the top 10 deadliest monster races for my account and looked at those statistics for Kolll. Taking a look at the kill ratio and death rate statistics, the top 10 deadliest races for my account include: purple worms, dragons, beholders, hezrou, ice flensers, abishai, drider, lich, efreeti, and mind flayer. Out of these, Kolll has only suffered defeats beholders and driders, Much of this is do to the fact that Kolll hasn’t encountered these enemies or they were added to the monster manual after Kolll complete the quests where these enemies typically occur. Table 12. 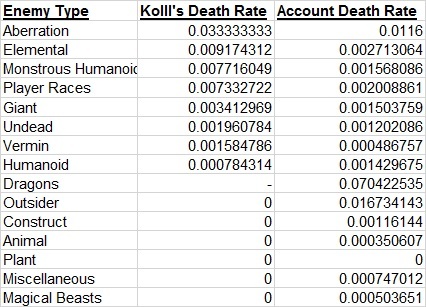 Top 10 deadliest monster races for my account using the kill ratio and death rate statistics and comparing those statistics to Kolll’s. These trends I have observed with Kolll are a little different from what I saw with Erdrique and Hamllin. This is primarily because Kolll is questing in a different level range than Erdrique and Hamllin and because he gets a lot less play time. Thanks for reading everybody!! Happy hunting in DDO everybody! !